Minimum 3 day(s) | Recommended 7 day(s)Sale! The best way to travel from the highland capital city to the tropical coast. Beginning and ending in Ecuador’s two most dynamic cities, this pass takes in all the mainland’s diverse regions from the mountainous highlands to the tropical coast, with enchanted jungle valleys and a charming colonial city in between. Delve into the amazing gold churches, perfect plazas and charming streets of Quito’s Old Town, the first UNESCO World Heritage Site. Explore the stunning Cotopaxi National Park by foot, bike or horseback with a chance to climb one of the world’s highest active volcanoes. Take in the awesome sights and vibe of Quilotoa Lake, a brilliant turquoise, 400-metre deep caldera created from volcanic eruptions thousands of years ago. Raft, hike, bungee jump and soak in hot springs in the valley of Baños on the borders of the Highlands and Amazon. Discover the picture-perfect plazas and off-beat, colonial vibe of Cuenca. Hike the 200 lakes, lunar landscapes and enchanted cloud forests of El Cajas National Park. End up in the vibrant city of Guayaquil, the gateway to the Galapagos. Remember, this itinerary is just our suggestion – you can hop on and hop off at any of our stops, extending your trip for as long as you like!. Bear in mind that, due to our bus schedules, you may need to add one extra day to our recommended itineraries at some stops before continuing your trip. It all depends on the day of the week. Please check our Timetables and Planning Guide. 06:00-07:00 Depart from Quito from your selected pick-up point. 09:30 Guidance at Cotopaxi National Park, home to one of the world’s highest active volcanoes. 12:00 Short visit to charming Pujili, a town famous for its dancers. Traditional lunch. 14:15 Guidance at Quilotoa. Explore the 3km-wide turquoise volcanic crater lake. 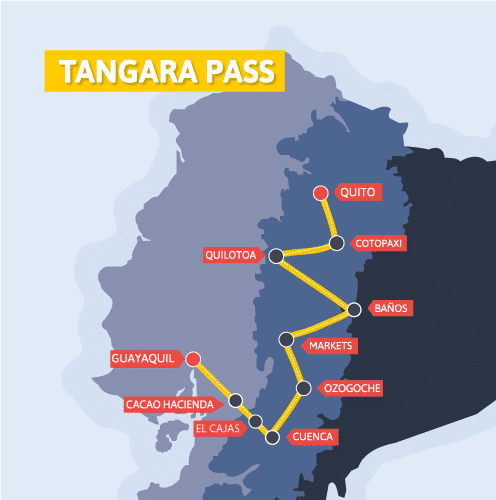 19:30-20:00 Arrive in Baños, home to steaming volcanoes, explosive waterfalls and hot thermal springs. FREE DAY to take a guided bike tour from La Casa del Arbol swing (selfie stick at the ready!) to the awesome Devil’s Cauldron waterfall. FREE DAY to explore the subtropical town, rafting in jungle ravines, bungee jumping into the valley, spotting exotic birds, hiking in the foothills of the active Tungurahua volcano and finishing the day soaking in steaming hot springs. 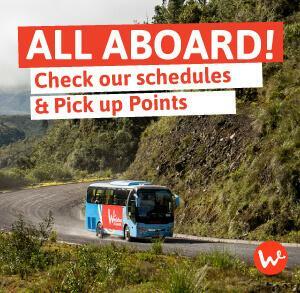 06:30-07:00 Depart from Baños from your selected pick-up point. 09:30 15-minute stop at the mirror-like Colta lake and Balbanera church for photos. 10:00 Visit Guamote or Riobamba to explore one of the most authentic markets in the country. Time for a local breakfast in the market. 11:00 Depart Guamote or Riobamba. 12:00 Guidance at Ozogoche, 45 lagoons for hiking, fishing and spotting highland wildlife amid dramatic landscapes. 13:00 Lunch at Ozogoche, made by the local community. 15:00 Short stop to visit Alausi. Those who wish to take the train hop off at Alausi. 19:30-20:00 Arrive in Cuenca, ready to explore one of South America’s most intact colonial cities. FREE DAY to explore the historic and bohemian charms of Cuenca, including visiting the Pumapungo Inca ruins, walking along the riverside, checking out the art galleries and shops, visiting a convent and enjoying the cafés, bars and clubs. FREE DAY to discover more of the treasures just outside the city, exploring Inca ruins in Ingapirca, marvelling at the beautiful river and skilled artisans of Gualaceo, and soaking in the volcanic hot springs under the stars. If you want to do the Quilotoa loop, add three to four days to your itinerary. If you want to take the Devil’s Nose train from Alausi, add two days to your itinerary. Hop off at Alausi, stay the night and board the Tren Ecuador early the next morning. In Riobamba, our first town stop depends on which day the market is. Passengers hopping off at Guayaquil must all be dropped off at Holiday Inn Guayaquil Airport. We travelled for the first day last Monday from Quito to Quilatoa. A great day made even better by Felipe's knowledge of Flora/fauna/ local information/ history and geography.